Looking up at the Moon, our nearest neighbor in space, we see a desolate landscape, full of mostly just craters. Other bodies in the solar system are similar, their surfaces marked by the impact of past meteors; on places like Mercury and the Moon, there isn’t an atmosphere to drive eroding winds or other processes that could erase evidence of craters, so we see them as a well-preserved record of geologic history. These records of the past are useful to understanding the story of our solar system, informing us of when lots of craters were flying around the solar system (such as in the Late Heavy Bombardment) and even of the size of these impactors. This helps to fill in the record of how our solar system formed, and what it would have looked like at various times in its past. In order to find craters, we usually need a human to look through images of these planetary surfaces. Automated crater detection programs do exist, but they’re often only good at recognizing craters for the specific images they’ve been trained with. The human brain is more versatile still, capable of adapting and recognizing patterns in varying conditions; this is especially useful for crater identification, since they exist on a large range of size scales, with varying illumination conditions and degradations that change the shape of the crater rim. A solution to this comes in convolutional neural networks (CNNs), which essentially try to replicate the structure of the human brain to take advantage of our capacity for learning and versatility. A neural network is made of layers of computational neurons, where the first layer takes in an input image, and the last layer generates an output. In between are various layers, weighted by importance; the network is then “trained” by tuning these weights to produce the correct output. More layers leads to an increased capacity to deal with complexity, but also more errors. 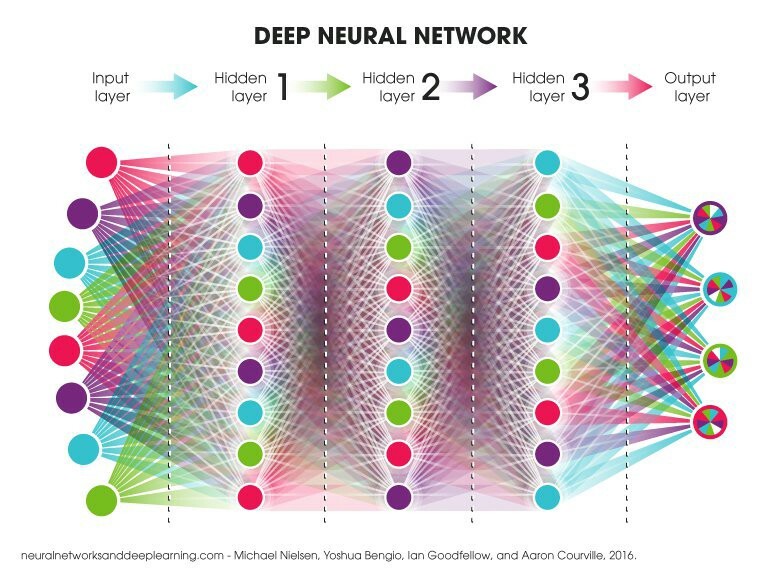 Neural networks are extremely useful in classifications, since a CNN will reliably make the same classification each time even when the features are not obvious, unlike humans. Machine Learning + Crater Data = ? In this paper, Lunar crater identification via deep learning, the authors apply a convolutional neural network to the problem of crater identification, specifically using data from the Lunar Reconnaissance Orbiter (LRO). Using a code they created and made available on github, they trained their CNN on human-created crater catalogs, providing the neural net with examples of the “output target” that should be created for the known data set. An example of these inputs and outputs for the LRO data is shown below in Figure 1 from the paper. Figure 1: A sample of the LRO data set used in neural network training. Left: the input DEM (digital elevation model) data. Middle: The human-created example of a CNN output target. RIght: Craters missed in original human classification are highlighted in red. The CNN used in the study successfully matched, and sometimes even exceeded, the detection rates obtained using the human-created catalog. Overall, after post-processing and fine tuning, the CNN had a 92% recall rate. The CNN alone, with no post-processing, was much better at detecting small craters (<15 pixels across) with a recall rate of 83%, compared to 75% recall for human detections. It also managed to find a substantial amount of new craters, as 42% of the test craters were newly identified by the neural net. Many of these newly found craters fell below the ground truth catalog detection threshold of 5 kilometers. The superiority of the neural net at spotting craters with small sizes is clearly shown by an analysis of detection count versus diameter, as shown in Figure 2 below. Figure 2: Plot of crater size (diameter, in km) versus crater count. The “ground truth” human classified catalog is shown in red, CNN results in blue. The CNN has higher detection counts at small sizes, but human identification still dominates at large scales. This is Figure 4 in the paper. Given that one of the prevalent problems with other detection methods is transferability, the authors wanted to test if their CNN would be successful in finding craters on a surface other than what it was trained with. After thorough testing with the lunar data, the CNN was applied to Mercury to determine if a Moon-trained algorithm effectively identify craters on Mercury. The answer? Yes! As shown in Figure 3, the CNN was successful at detecting the Mercury craters, despite the different illumination conditions and crater appearances. Figure 3: Input and output layers for the lunar-trained CNN applied to Mercury. Left: input DEM (digital elevation model) data. Middle: CNN output identifications. Right: Overlaid comparison of crater identifications and real data. This is Figure 5 of the paper. Moving forward, the creators of this neural net want to try applying it to other solar system bodies and more detailed data sets on the Moon. A successful detection algorithm like this has the potential to make our crater catalogs more complete with a systematic campaign to find smaller craters. When applied to lunar data, knowledge of craters can help scientists tell the story of how our Moon formed. If it is successful on other solar system bodies, it can even help tell the story of how our whole solar system became what it is today.